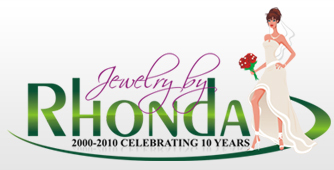 Jewelry by Rhonda - Calla Lily Wedding Jewelry, Bridesmaid's Calla Lily Jewelry, Bridal Calla Lily Jewelry, Calla Lily Jewelry for Weddings! Necklace - This single calla lily necklace is on a 16" sterling silver cable chain (yes, we can customize the length - just email me.) with one approx. 3/4" long sterling silver calla lily pendant with a genuine cultured freshwater pearl in the front. There is a 2" sterling silver extender with a dangling pearl in the back of the necklace. This calla lily pendant is made in the USA. Pearl Bracelet - This bracelet choice is a string of genuine cultured freshwater pearls with a single matching calla lily dangle. There is also a 1" extender with a dangling pearl. Chain Bracelet - This bracelet choice matches the necklace - 7" sterling silver cable chain (yes, we can customize the length - just email me.) with one approx. 3/4" long sterling silver calla lily pendant with a genuine cultured freshwater pearl in the front. There is a 2" sterling silver extender with a dangling pearl in the back of the necklace. Calla Lily Earrings - These earrings are on sterling silver Frenchwires with matching calla lily dangles. They dangle approx. 1-1/4" long. 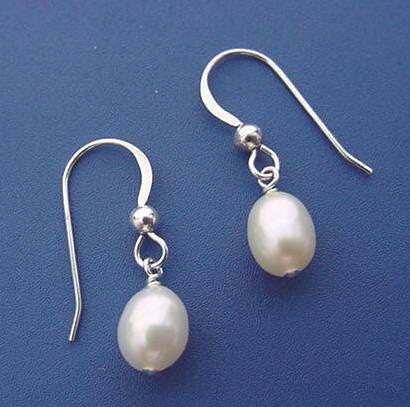 Pearl Drop Earrings - You also have the option of sterling silver genuine cultured freshwater pearl single drop earrings. Gorgeous bridesmaid's jewelry gift sets (necklace and calla lily earrings 2-piece jewelry sets)! You also have the option of sterling silver Frenchwire freshwater pearl dangle earrings instead of the calla lily dangle earrings in your single-drop calla lily jewelry sets. Sterling Silver Freshwater Pearl Calla Lily Charm for charm bracelets. What a pretty ring - so flattering on the finger! This is a sterling silver adjustable (just give it a gentle squeeze to fit your finger) freshwater pearl calla lily ring to match this calla lily jewelry. The ring sits on the finger approx. 1/4" high and is the same calla lily design. The band of the ring is approx. 2.5mm. The freshwater pearl is approx. 5mm. What a great item to complete your calla lily jewelry set! Available in two sizes: Small (fits 5-7) and Large (fits 7-10).